Everyone loves a good list. Letterman might’ve been the greatest list maker/reader/practitioner – inspiring and empowering an entire generation of copy writers that regale us with their amazing listacles all around the web! We thought we’d throw our hat into the fray and put together a list of common mistakes, with a heavy dose of snark, on how to avoid being labeled an email marketing rookie. Everyone wants to hear from us. No really, everyone! No, no, everyone doesn’t want to hear from you. Some only wanted to hear from you once to buy a specific item and then unsubscribed or marked your email as spam. Assuming everyone wants to hear from you is tantamount to ignoring your customers. Cadence, shmadence, I wanna be in their inbox every single day! How often you send email is important, the time that you send it can be directly tied to your business, e.g. you run a restaurant that wants to advertise lunch specials, sending it at 1145 might’ve missed the mark. Responsive design? What’s that? It’s what makes emails look good on mobile phones. Responsive email templates are not only the rage, but in our hyper mobilized world they’re an absolute necessity. Bounces? We didn’t bounce, we just didn’t make it all the way in so we’re gonna keep trying that email until it delivers! That’s spot on–NOT! So if you do that, you may look like a spammer to an ISP. Spammers don’t respect hard bounces, they send lots of emails that will hard bounce, and generally don’t do anything about soft bounces. Bounce policy is what sets you apart from the bad guys and helps you build a positive sending reputation. A friend told me that he knows a guy that knows a guy that has a really big opt-in database for sale! We could triple or quadruple our open rates! Don’t ever do this. Just don’t. It won’t end well. I assure you; and so will a lot of other experts in the field. This is not the marketing strategy you’re looking for. Use as many IPs as possible. If one gets blocked, just route the mail on another one! Again, this is a tactic commonly used by spammers. If you do this you will only decrease the likelihood your email will arrive to the inbox. Setup an IP for commercial email, and one for transactional and build positive sending reputations on both. That’s the only route to success. Unsubscribes are for losers. I can’t. No Seriously. Where do I begin? Unsubscribes are not only a good practice to avoid making your customers angry, but it’s required by the CAN-SPAM act of 2003. You must have a working electronic unsubscribe. That’s all there is to it. We’re going to make email great again by sending as much of it as possible! Then you might as well shutter your business now and save us all a lot of grief and clicks of the spam button. The right amount of email will change from business to business, but what’s universal is that everyone has a threshold where enough is enough. Experiment with different amounts of email for different users. This means having data to gauge how and when they consume your email. Targeting? We don’t target, we canvas! Ever heard the phrase the right email for the right person, at the right time and optimized for the right platform? Well now you have. Targeting an offer to a person most likely to be receptive to it requires past purchase history, preference centers, opens, clicks, unsubscribe data, all of the things that help you be smart about your digital communications. Segmentation? We use a segment of one: everyone gets every email. No no no no. This isn’t how it works. A segment of one means you know so much about your customer that everyone is unique and you personalize the heck out of every communication making it a unique experience. Yeah, it’s not easy, you need real time data, flexible templates with personalization capabilities in your platform and an appreciation for how different segments should be marketed to in different manners and with uniquely different content at times. Blacklist? Wasn’t that something that happened in Hollywood in the 50s during McCarthyism? Yes there were blacklists in Hollywood, and it’s also a show starring James Spader. However, blacklists are very real and very damaging should your IP or sending domain land on one. Having integrated tools like 250OK in your email platform reduces the likelihood of being on a blacklist and not knowing, and expedites remediation (along with a crack deliverability team) should you land on one. SPF, DKIM, DMARC, ARC… stop my head’s hurting from all these acronyms. Acronyms got you down? I know you how you feel. However this is important so listen up. SPF, DKIM, DMARC, ARC these are all part of a category of technologies called email authentication and they are really important because they help you protect your brand, and your customers, from phishing and spammers. You don’t want some criminal halfway across the world spoofing your domain and pummeling inboxes with email designed to defraud people do you? You know what happens then? You get laid off, your business fails and the dark side wins. Talk to your tech team, or our tech team and we’ll help you navigate the authentication waters. We should try and win back every customer that unsubscribes, you never know, they may change their mind! Whooooa, hold your horses there! I agree, you should try to win them back, but re-subscribing unsubscribers is a major no-no, you can land in hot water with numerous folks. However, getting inactive subscribers to become active is an absolute strategy and you should do it like so: slowly and with extreme caution. I’ve heard from ISP postmasters that re-engagement campaigns generate high complaints and that’s bad news for a sending IP or brand. Send these emails slowly in very small batches around the clock. Make it an ongoing best effort basis vs. a giant airdrop all at once. Subject lines need to be big bold and say anything to get them to click. No, no they don’t. No really, if you don’t believe me read the FTC’s guidelines. Truth in advertising. Be edgy, be bold, be creative, be all that, just be honest. If not, refer to rule #12. Put as many offers as you can into the receipt or shipping confirmation. It’s a guaranteed chance to get in front of them for more sales! I’m gonna say fuhgeddaboudit! Transactional email closes the loop on a transaction, generally initiated by a customer. There is an unwritten rule that says 80% of the content in a transactional email should be just that, transactional, 20% marketing. If you pack in too much marketing you change the fundamental content and nature of the communication. Transactional email should be sent on its own IP to create a ‘separation between church and state’ from commercial email for just this reason. Hey why don’t we make the font for our unsubscribe link white, like the background?! Once again I get to say don’t you dare! And why do I say this? I refer you back to the FTC’s guidelines. Let this be your guiding principle: clean and conspicuous. And if you need another reason chew on this: if someone unsubs they can always re-sub at some later point. If they mark your message as spam because they can’t find the unsub link, or you didn’t include it, then your entire reputation suffers, its harder to deliver email, your revenues decline, you get fired and the dark side wins. Which do you prefer? Someone said millennials like snark, can we just make our postal address 1600 Pennsylvania ave? Or maybe 666 Elm St.? Who reads that stuff anyway?! And you wouldn’t believe what will happen if you do this. Yeah, once more, FTC, CAN-SPAM, valid, physical mailing address is required. And if you need another reason: you’re not a spammer, so don’t act like one! There you have it! 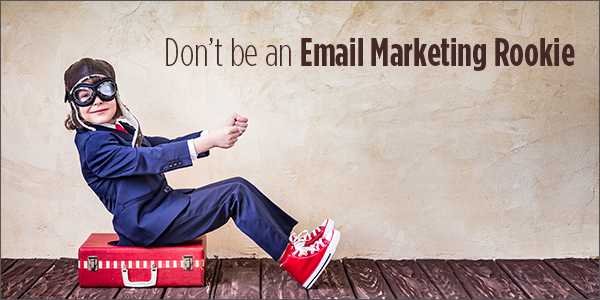 A comprehensive list of email marketing rookie mistakes, and how to avoid them. Anything we missed or overlooked? Leave us a comment! Number 5 might also be illegal. As you need opt-in (i.e. prior consent) for emails sent in the EU.